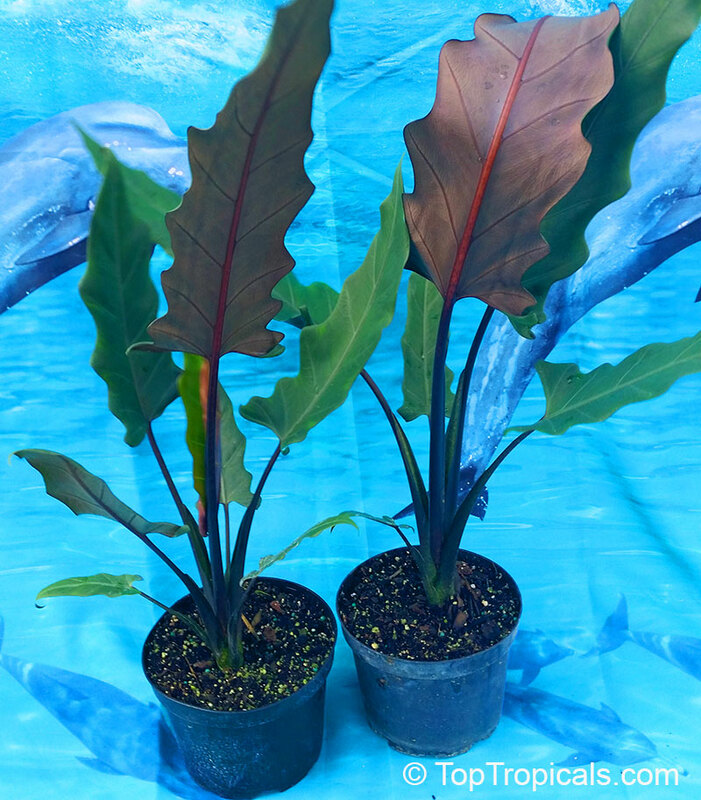 Cannova Mango Canna features bold spikes of salmon flag-like flowers at the ends of the stems from mid summer to early fall, which emerge from distinctive dark red flower buds. These sweet salmon-shade of high-impact blossoms stand out in any landscape. 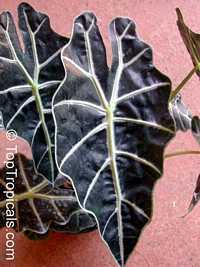 Attractive large glossy pointy leaves remain dark green in color throughout the year. 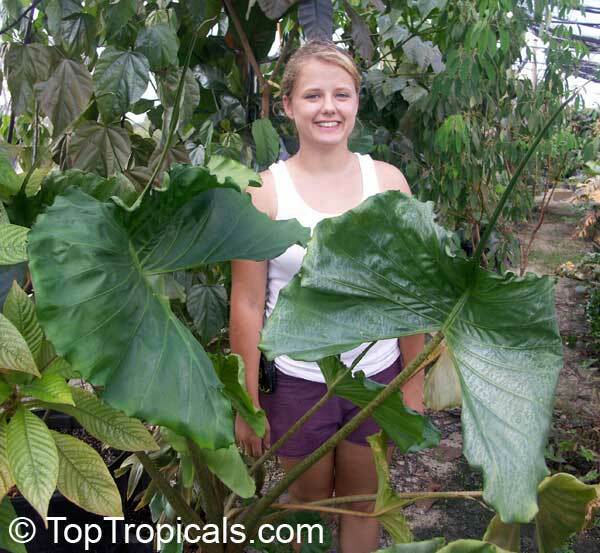 It will grow to be about 4 feet tall at maturity, with a spread of 20 inches. 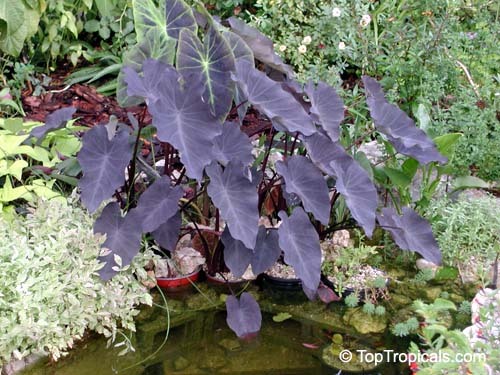 With its upright habit of growth, it is a fine choice for the garden, but it is also a good selection for planting in outdoor pots and containers. Reliable in both cooler climates and sweltering heat, the exotic-looking beauties will electrify any garden with vivid color all season long. Very showy collectable variety of Canna Lily with orangy-yellow flowers and spectacular chocolate-burgundy leaves. 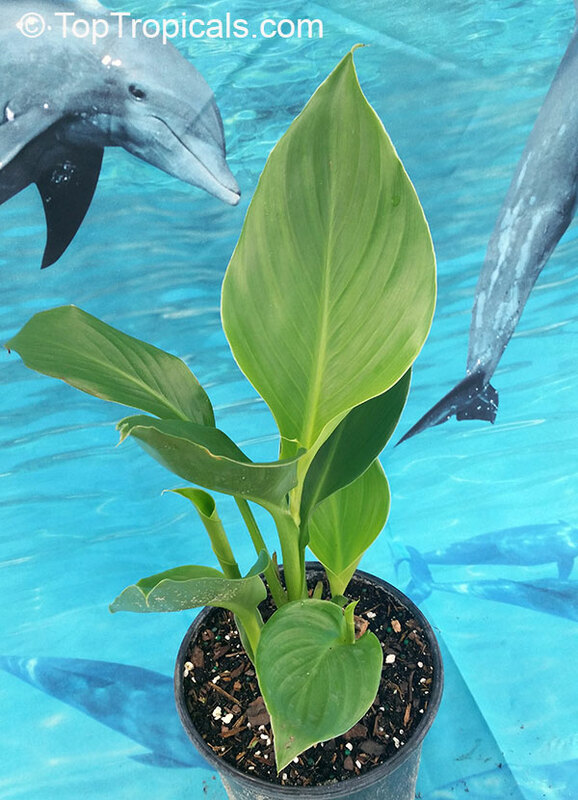 Dwarf variety, grows only up to 3 ft. Each stem will produce blooms year round when mature. 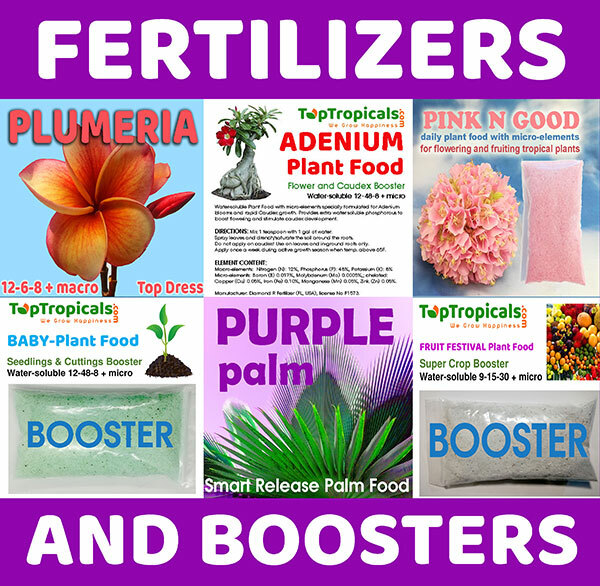 Adds instant color in mixed containers or landscapes. Tolerates flooding, grows well along waterline. Used in seed jewelry. This species is also used for necklaces and rosaries in India. 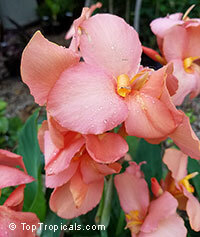 Very showy collectable variety of Canna Lily with orange flowers dotted with a spray of red. 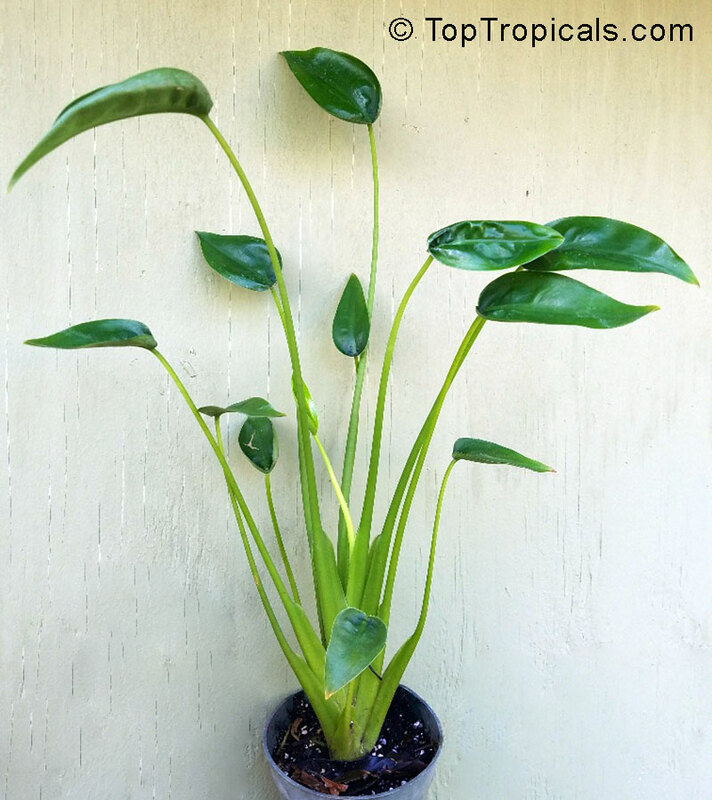 Dwarf variety, grows only up to 3 ft. Each stem will produce blooms year round when mature. 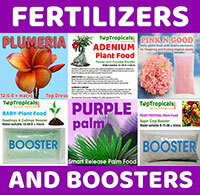 Adds instant color in mixed containers or landscapes. Tolerates flooding, grows well along waterline. Used in seed jewelry. 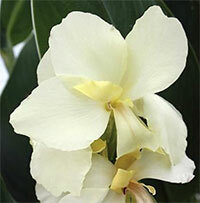 This species is also used for necklaces and rosaries in India. 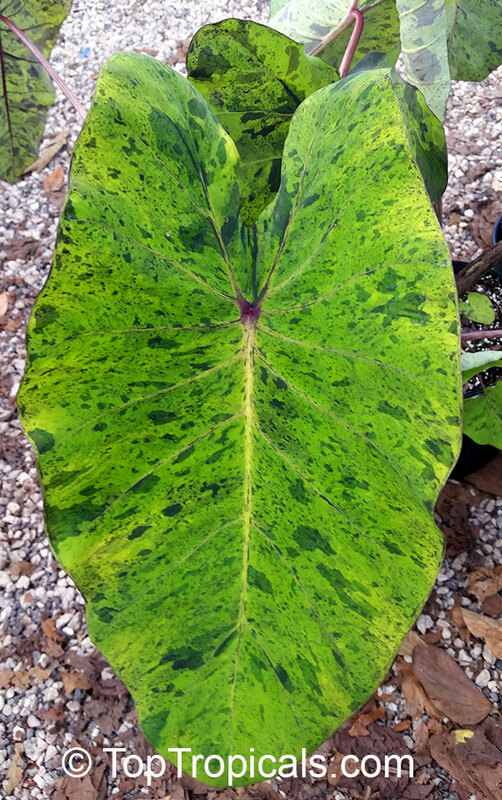 Spectacularly variegated canna Pretoria aka Bengal Tiger offers large chartreuse and cream striped leaves with a purplish red margin. Shades of orange (varying with the seasons) large blooms. 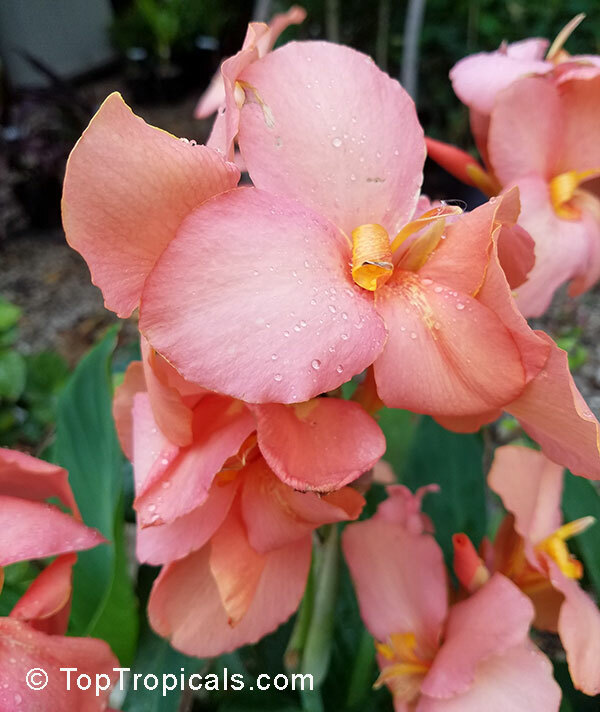 Extra gorgeous vividly colored canna. 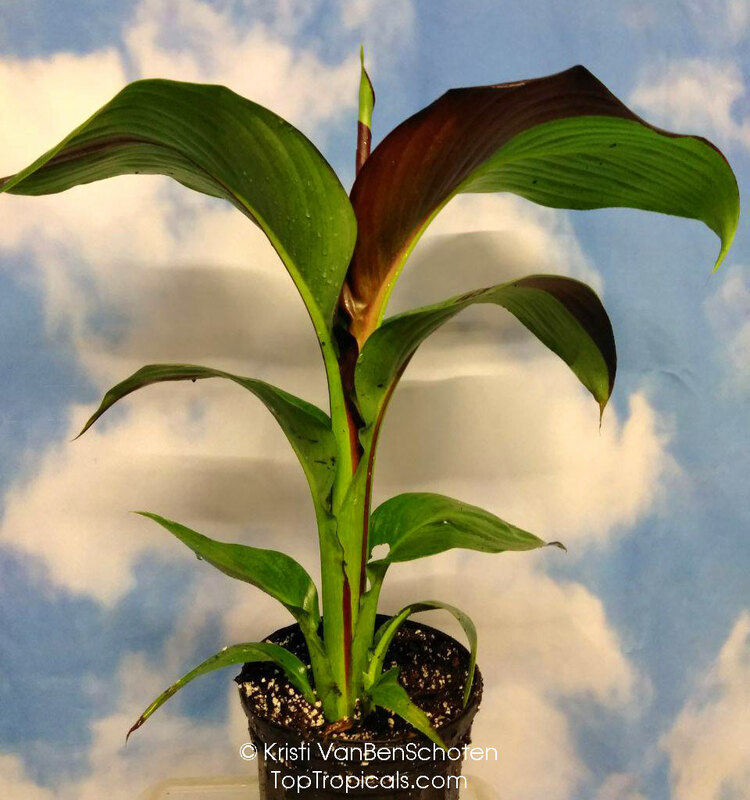 Also called Canna generalis Aureostriata, it is imported from India. 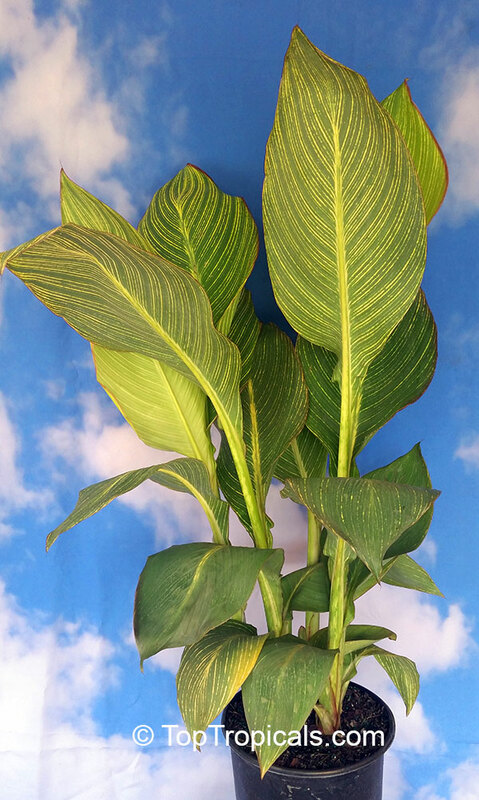 It is a sport of Canna Wyoming that originated from radiation experiments in the 1950's at India's Agri Horticultural Society. 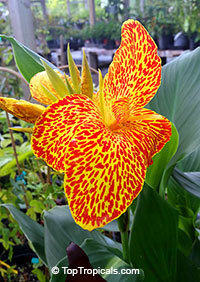 Considered by many to be the most beautiful of canna lilies. The dramatic stalks of green- and yellow-striped variegated leaves with a brilliant maroon edge grow to 6' and are topped in summer with bright orange flowers that are favored by hummingbirds. 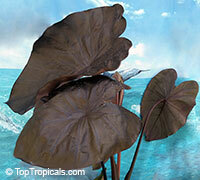 Will also grow in water as an aquatic plant. Awarded the prestigious Royal Horticultural Society Award of Garden Merit in 2002. 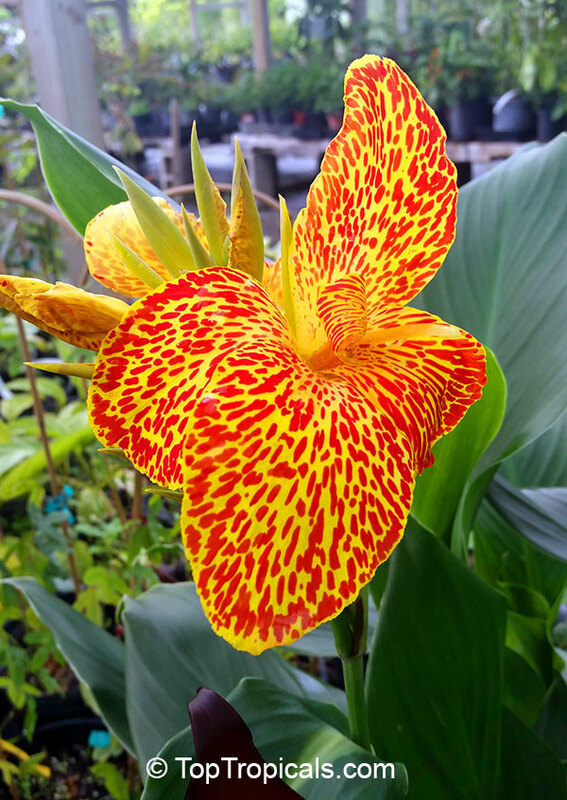 With radiant, off-white blooms, Canna Lily Alaska is a beautiful addition to any garden. 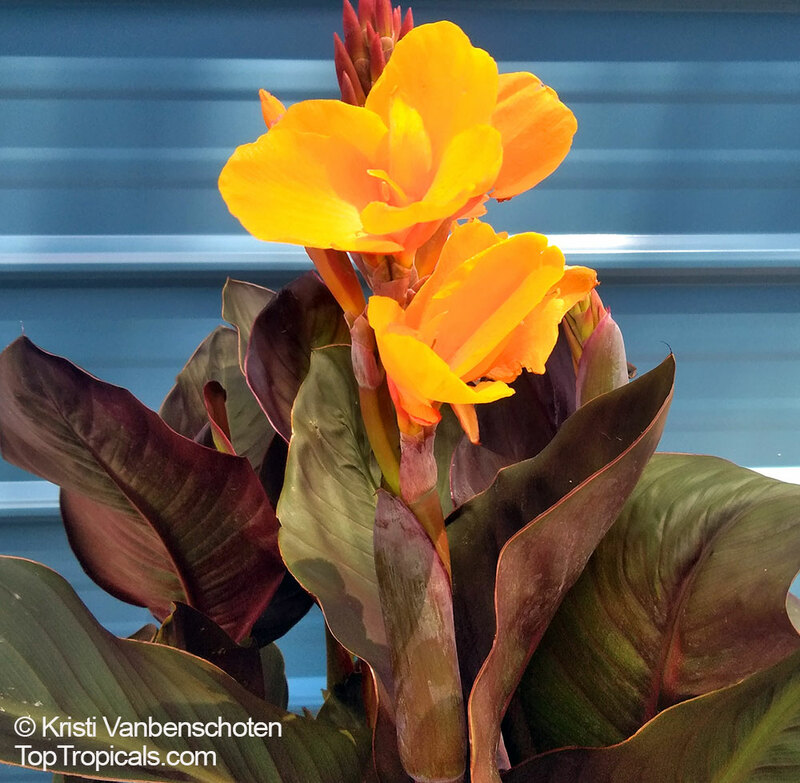 This canna is perfect for containers and small-space gardens where you want to create a classic statement. Collectable variety of Canna Lily with bright red flowers and burgundy leaves. 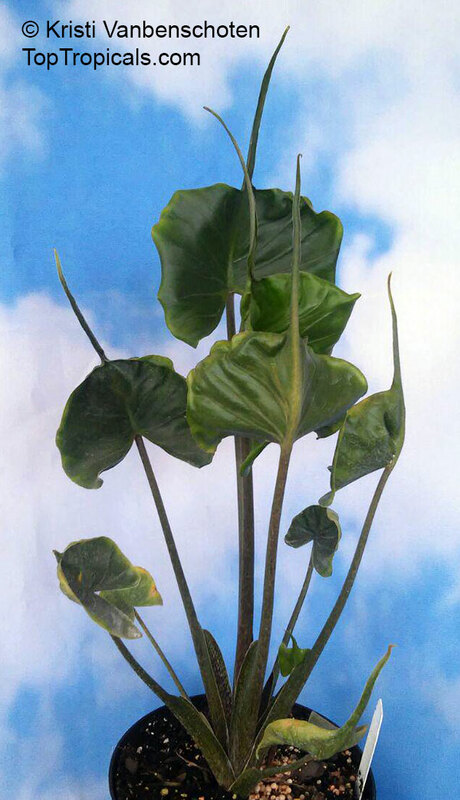 Each stem will produce blooms year round when mature. Adds instant color in mixed containers or landscapes. Perennial growing up to 6-7 ft, with long narrow leaves and showy red flowers. Tolerates flooding, grows well along waterline. Used in seed jewelry. This species is also used for necklaces and rosaries in India. 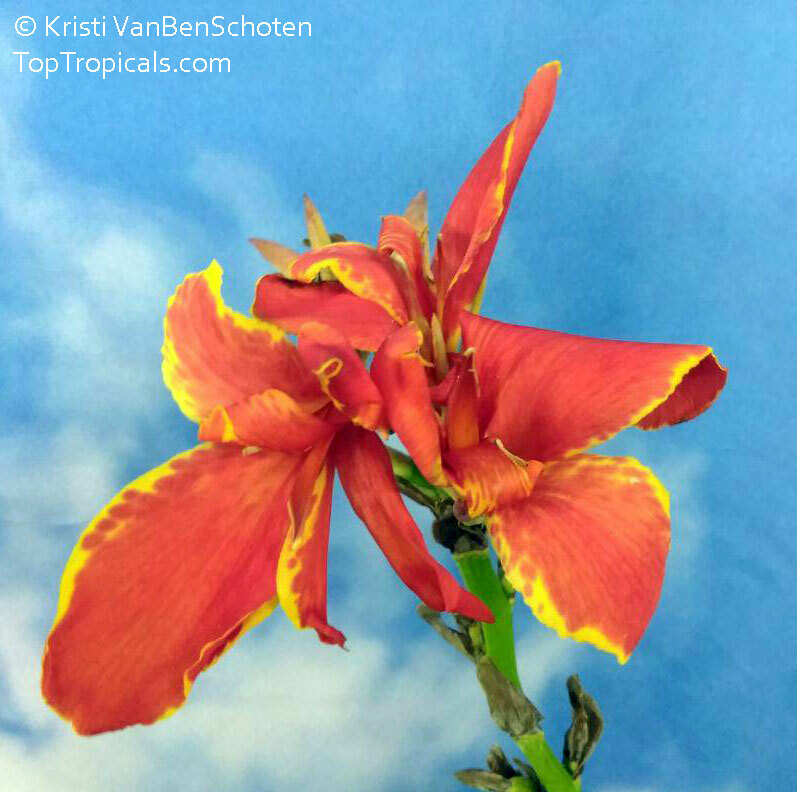 Cleopatra hybrid is a dwarf variety and one of the most beautiful cannas you can find. Flowers are bright red and bright yellow all on one plant! 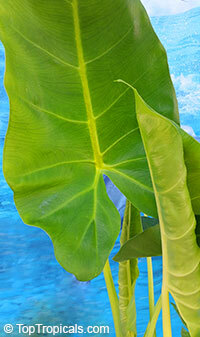 The lush foliage has shades of green and purple keeping color in the garden even when it is not flowering. 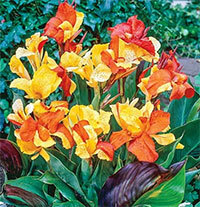 Cleopatra Canna is a show stopper, the flowers are like an exotic iris. 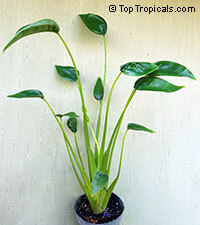 Plants are compact growers, great for a container garden. A dwarf Canna, the Madeira will shine in the border of any garden. Its blooms are a lovely red with subtle, yellow edging. Each stem will produce blooms year round when mature. 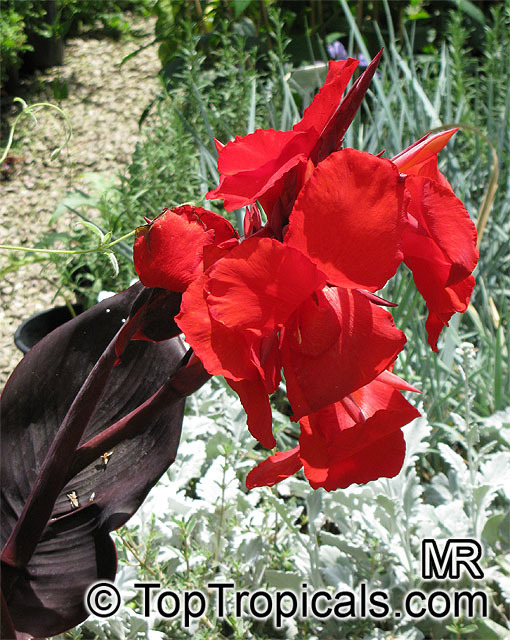 Adds instant color in mixed containers or landscapes. 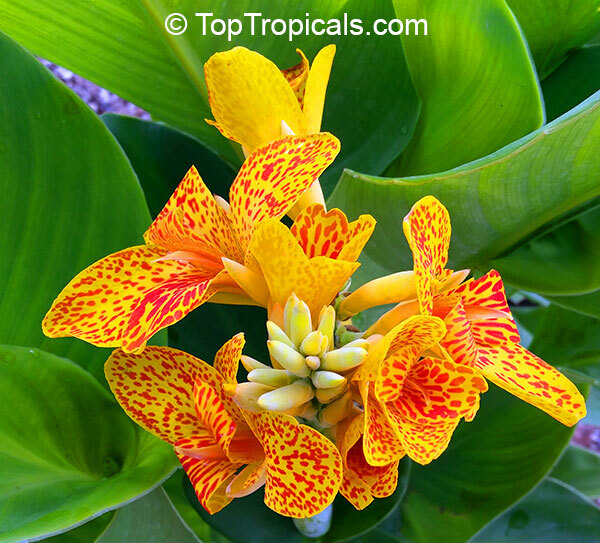 Very showy collectable variety of Canna Lily with yellow with orange speckled flowers. Each stem will produce blooms year round when mature. Adds instant color in mixed containers or landscapes. 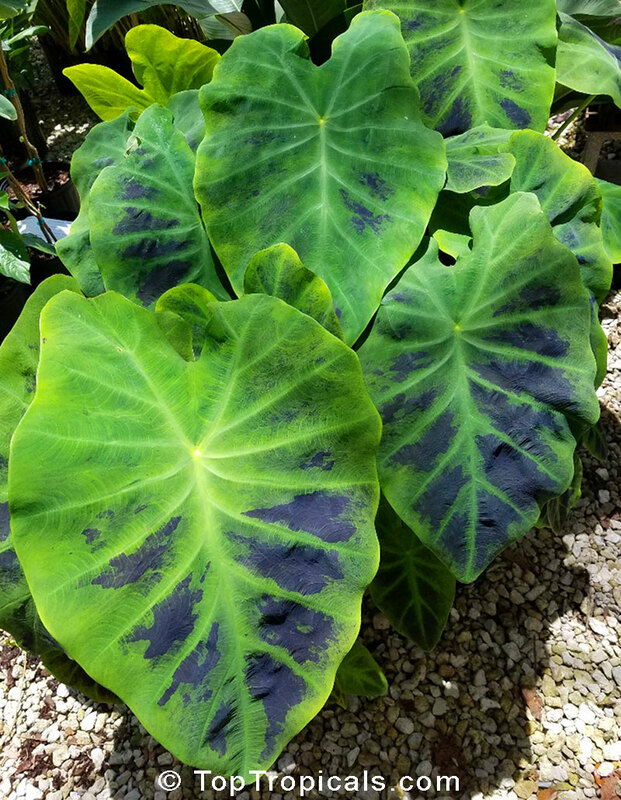 Illustris Colocasia is a classic beauty. The heart-shaped, large purple-and-green leaves of Illustris are huge, and their dark highlights are stunning. This elephant ear is a lover of moist shade, but does best with a little dappled sunlight. It will tolerate boggy conditions. 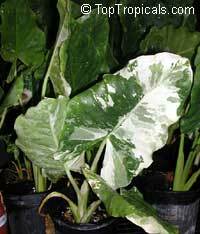 Provide light shade to full shade and consistently moist or boggy soil. It is a strong fast growing variety that does great in container, landscapes, ponds and patios. 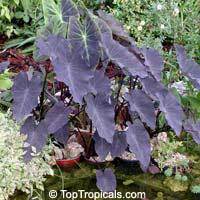 Darkest of all Colocasias with dark purple stems and leaves. 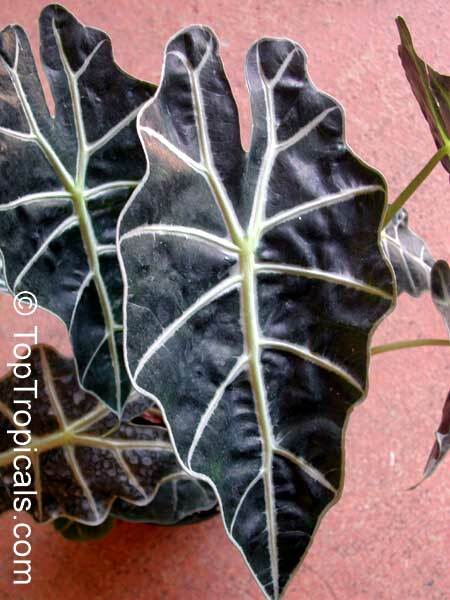 Elegant glossy dark black foliage with blue veins held on dark petioles (stems). Tidy, clump forming habit with short runners developing close to the mother plant. 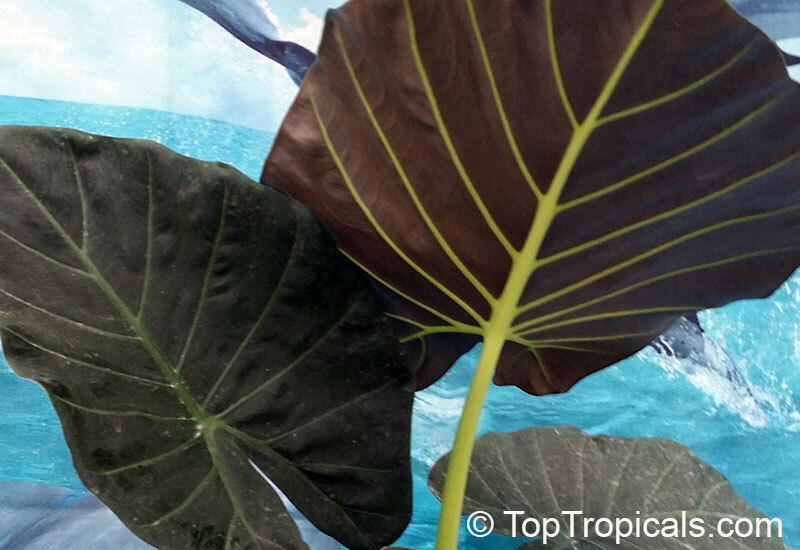 This Black Beauty colocasia is a must for black plant fanatics. 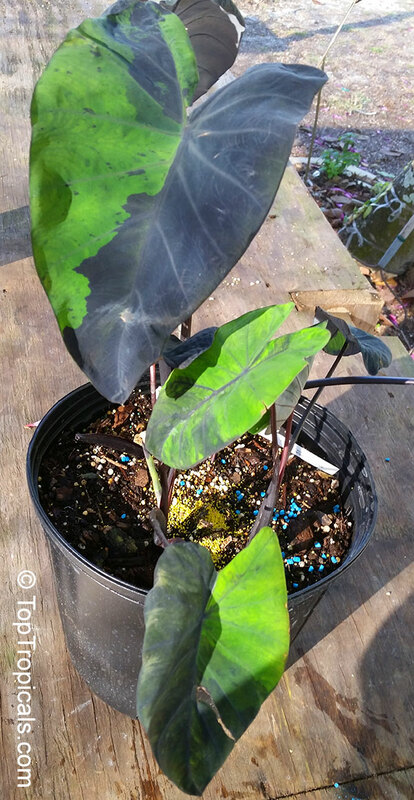 It has large matte black, heart shaped leaves on black/purple leaf stalks. 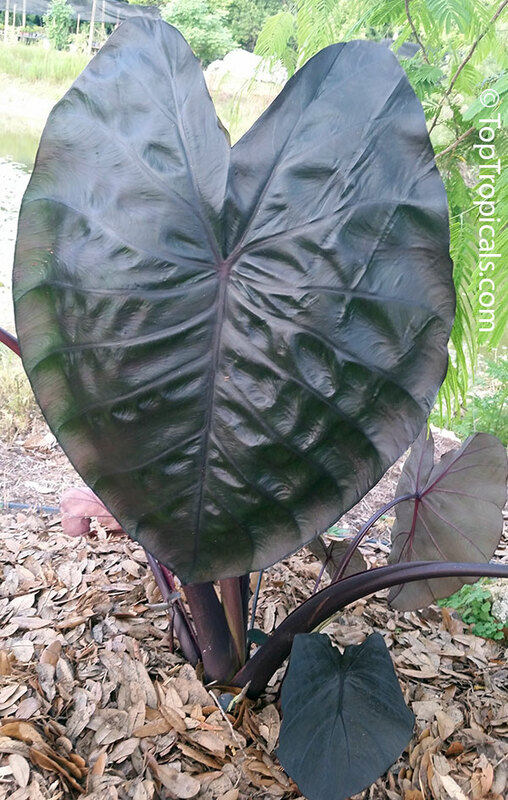 As with most elephant ears, moist soil and high nutrition are the keys to great specimens. In shade leaves turn dark green. Once moved to bright sun, they turn back to black. 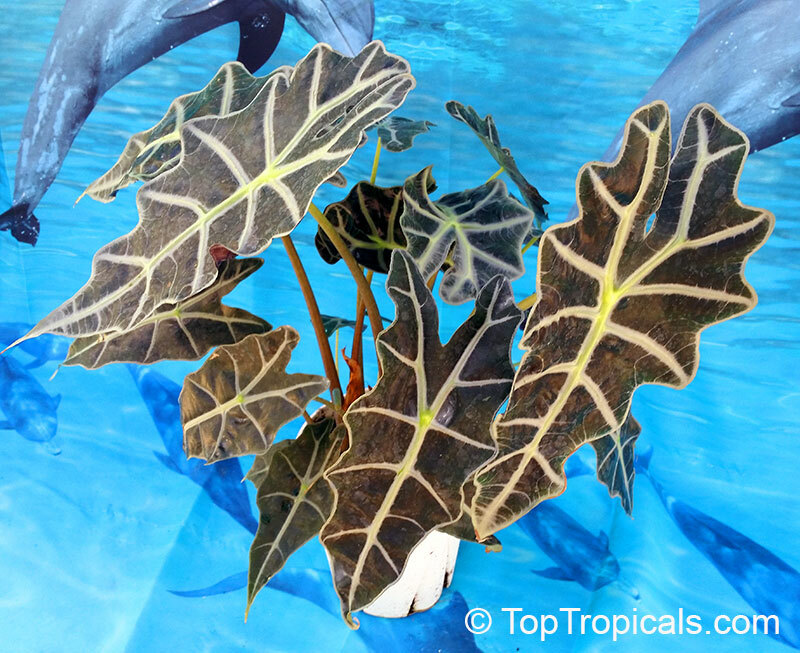 In cooler subtropical climates leaves die back and the plant emerges from a rhizome in spring. The 15" long, glossy, chocolate-black, lightly ruffled-edged leaves compose a well-behaved 4' tall clump. 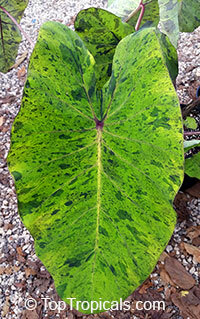 A new hybrid with unusual leaf pattern of black and green. 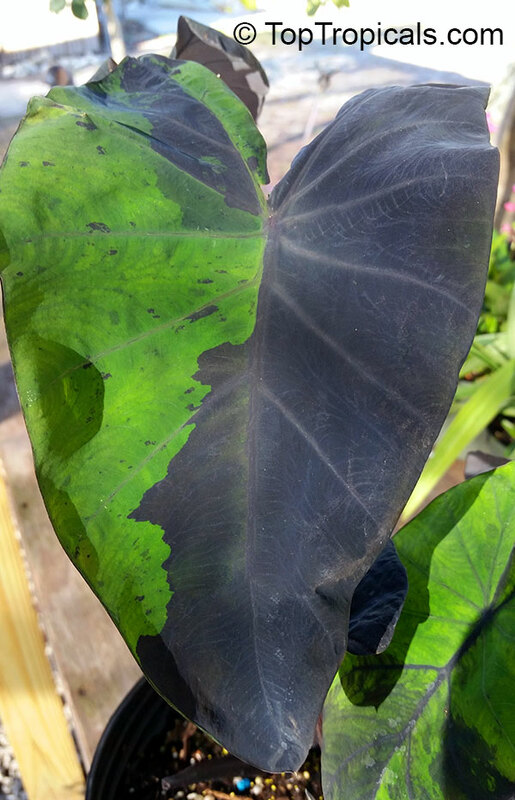 Incredible contrasting blacks and greens adorn its leaves. 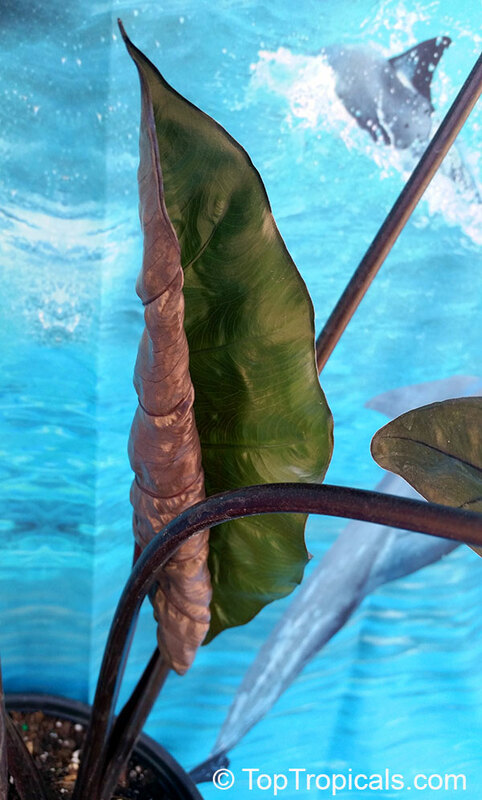 This camouflage effect is matched with light green stems streaked with dark purple that fade up to pink, with chartreuse highlights mixed in to create a totally wild and exotic scene in the summer garden. 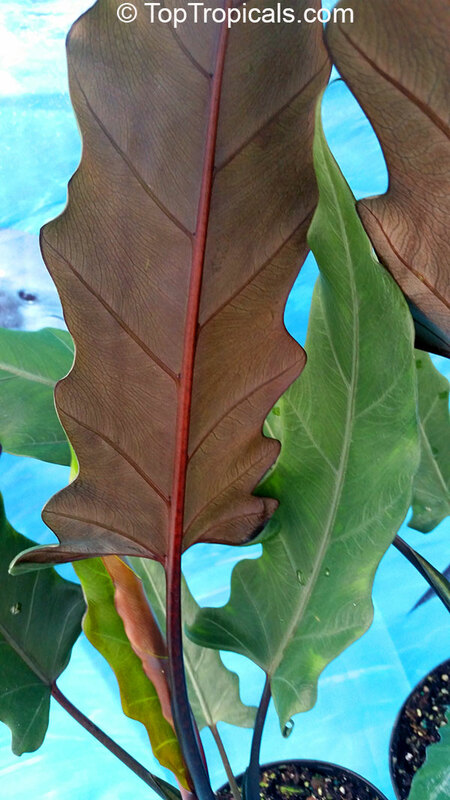 No two leaves are the same. Even the stems are highlighted with stripes. Grows more compact than other Elephant Ears, making it an excellent choice for a large container.